You have probably heard about this cutting edge way of diving. Here at Simply Sidemount we are dedicated to giving you the best possible tuition in this discipline. Our training will give you the knowledge, skills and experience so that you become one of the most safe, streamlined, agile and confident divers in a single cylinder and twin cylinder configurations. Its about taking your cylinders off your back, splitting them and placing them on your sides so they become independent of each other and more safe to dive with….is that it ? …not at all! Sidemount diving provides divers with a level of training and confidence above and beyond the PADI self reliance course, by giving you the knowledge and skills to be able to deal with possible emergency scenarios that a normal backmount diver wouldn’t. Not only do you benefit from true redundancy, but we believe this is the easiest safe and most simple way to breathe and not waste your gas supply. Sidemount diving is not something new – it has been around in the UK since the 1960s! British cave divers, renowned for being the safest of divers, have been using the system for years. In recent years it has been modified slightly to accommodate our kind of diving; adopting the ‘Hogarthian method’ of donating a long 2m hose to an out-of-air diver. Some people find it hard to reach their cylinder valves behind the back of their neck while wearing a twinset, but they still want the extra cylinder to increase their time diving underwater. 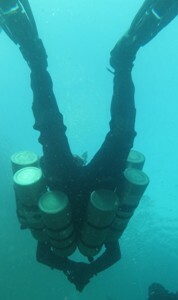 Even divers wearing a single cylinder on their back would fail to be able to conserve their air in the event of a major air leak and are forced to surface. Being able to see your valves and first stages is comforting in case of an incident. So, for them, moving the cylinders to somewhere they can easily reach the valves makes perfect sense. Others find carrying a large amount of weight on their back somewhat heavy causing back pains… stopping them from diving as much and in some cases entirely. Not only does diving Sidemount diving relieve pain underwater but also on the surface…Think about it, when you visit the dive site, we tend to go for a look at the conditions of where we going to get in, take advantage of this and bring one of your tanks. You then only have to carry just one cylinder down to the water and come back for the other one when you’re ready to get in, instead of hauling a twinset just before you start your dive. Boat dives are especially good for this, when you can get in the water with one cylinder, both or none (depending on the conditions) and have someone pass the other cylinder(s) down to you or, simply attach the cylinder(s) bolt snaps to a gearline fixed to the boat or buoy. 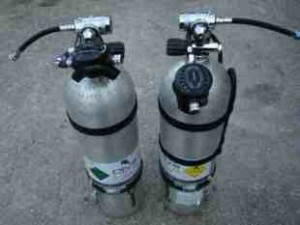 Twinset divers often have a larger surface area due to cylinders being mounted on their backs, therefore, creating increased drag on the diver, therefore giving rise to an increase in air consumption (SAC rate)….Placing those cylinders under your arms, significantly reduces drag to such a degree that you can surface with more air than your average buddy diving with a twinset. Diving Sidemount and a comprehensive course will also improve your profile, trim and streamlining as well as improve your buoyancy skills. Diving in a ‘custom fit’ Sidemount harness improves your flexibility and comfort rather than a solid steel backplate. Also the harness is tailored to fit any shape of diver, contact me for information regarding this. 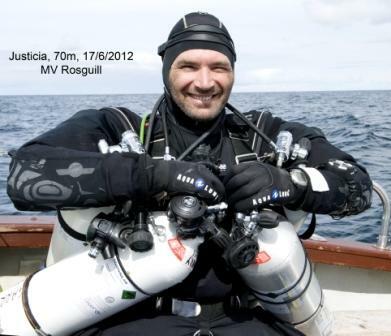 Diving Sidemount and the course provides you with a safer redundant air supply making you feel more at ease knowing you’ve got plenty of air and the skills with it. Another advantage is aimed at underwater photographers/videographers who will appreciate how difficult it is to capture that perfect image or shoot video when in backmount configuration…Sidemount gives the diver a near perfect balance to hold any position in the water column whether it be in a drysuit or wetsuit. The course also teaches you multiple finning techniques for that environment including reverse kicks…an awesome and neccessary skill to have as a photographer. Diving Sidemount gives recreational divers a taste of ‘Technical training’, we call it ‘Tecreational’ and Tec divers can learn other technical courses, for example , Deco 40 (with optional limited trimix) up to Full Trimix whilst in Sidemount. Rebreather divers can use Sidemount configuration for their ‘bailout’ cylinders to improve their profile, therefore eliminating their ‘stage mount’ cylinders from banging and swinging about, creating that pendulum action. Sidemount multi-staging also offers the technical diver to add their ‘stages’ in sidemount configuration, this allows any of the cylinders to be removed if needed and placed in positions for decompression, or for retrieval on exiting a cave system. As with any course, correct equipment and proper training are essential if not vital to ensure mastery of skills !